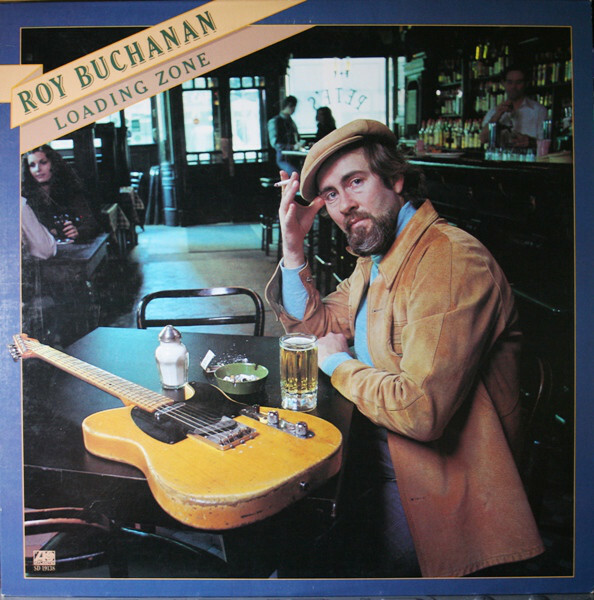 ROY BUCHANAN-LOADING ZONE AND YOU’RE NOT ALONE. In 1977, Roy Buchanan was thirty-eight, and about to record his second album for Atlantic Records, Loading Zone. Roy Buchanan had been paired with Stanley Clarke, the classically trained pioneer of fusion. Roy Buchanan and Stanley Clarke looked like an unlikely partnership, but one that ultimately got results. Proof of that Loading Zone, which was recently paired with You’re Not Alone by BGO Records, who have remastered and reissued both albums as a two CD set. They’re the perfect introduction to the late, great Roy Buchanan whose career started when he just fifteen. That was when he joined Johnny Otis Rhythm and Blues’ review in 1954. For Roy Buchanan, that was the equivalent of a musical apprenticeship, and set him in good stead for the rest of his of career. Four years after turning professional, Roy Buchanan made his recording debut on Dale Hawkins’ 1958 single My Babe. For the next couple of years, Roy Buchanan was in Dale Hawkins’ band. That was until Dale’s cousin Ronnie Hawkins came calling. Dale Hawkins was in the Toronto, in middle of a tour when call came through his cousin Ronnie Hawkins. He was looking for a guitarist for his band, and Roy Buchanan fitted the bill. With Dale’s blessing, Roy Buchanan joined the band. Ronnie wanted Roy to take his existing guitarist under his wing. With Roy’s guidance, the young Robbie Robertson came on leaps and bounds. After a spell with Ronnie Hawkins’ band, Roy left and headed home to America. Later, Ronnie Hawkins’ band became The Band, one of the most important and influential bands of the late-sixties and early seventies. Meanwhile, Roy Buchanan had released his debut single Mule Train Stomp on Swan in 1961. After this, Roy spent the first half of the sixties playing in various bands, including Danny Denver’s band. By then, Roy had put down roots in the Washington DC area, where he had acquired a reputation as one of the great rock guitarists. This lead to guitarists travelling from far and wide to challenge Roy Buchanan to what he call a “pick-off.” Guitarists came Roy conquered them, with this superior, virtuoso skills. That was until Roy changed direction musically. In March 1968, John Gossage a photographer who was a friend of Roy’s gave him tickets to see Jimi Hendrix. That night, Roy watched as Jimi Hendrix recreated what he saw as his own unique sound. The difference was that Roy used his hands to create the wah-wah sound, while Jimi Hendrix used a pedal. Despite having carefully crafted his own sound, Roy decided to turn his back on it, and concentrated on a American roots style guitar picking. In doing so, this left the field clear for Jimi Hendrix, who Roy always had the utmost respect for. So much so, that he would later cover some of his songs. Before that, Roy’s decided to change career. During the second half of the sixties, Roy was dividing his time between playing in various rock bands and working as a session musician. By then, Roy was married with a family. The life of a professional musician wasn’t the most stable, so Roy decided to retrain as a men’s hairdresser. Roy Buchanan was very nearly lost to music forever. As the seventies dawned, Roy joined the Danny Denver Band, who had a following around the Washington DC, Virginia and Maryland tristate area. However, when he wasn’t playing with the Danny Denver Band, Roy was playing solo gigs. It seemed he hadn’t given up on his dream of making a career out of music. The dream became reality in 1971, when Public Service Broadcasting filmed and aired a one hour documentary entitled Introducing Roy Buchanan. Someone from Polydor Records saw the documentary, and soon, they had signed Roy Buchanan to a recording contract. Roy would go on to release five albums on Polydor. A year after signing to Polydor Records, Roy Buchanan released his critically acclaimed eponymous debut album. It was an understated and sparse album of genre-melting music, where Roy switches between blues, country and rock ’n’ roll. Despite its undoubted quality, commercial success eluded the album. However, this was about to change. When Roy returned with Second Album in 1973, it was the album that almost wasn’t recorded. Roy asked Polydor if for his sophomore album, he could record and release a live album? Polydor didn’t want a live album. However, Roy secretly recorded and self-released a live album using the alias Buch and the Snakestretchers. With the same that band that recorded the live album, Roy went in to the studio and recorded Second Album, which stylistically was similar to his eponymous debut album. However, there was a shift more towards the blues, which is Roy now regarded as a pioneer of. Second Album was released in 1973, to the same critical acclaim as his eponymous debut album. However, Second Album caught the attention of the record buying public and sold over 500,000 copies. This was enough to earn Roy his first gold disc. By then, John Lennon and Merle Haggard were among Roy’s admirers. So to were the Rolling Stones. They were so impressed by Roy Buchanan’s guitar playing, that they asked him to join the Rolling Stones. Roy turned the Stones down, and cemented his place in rock history as the man that turned down the Rolling Stones. Buoyed by the success of Second Album, Roy returned with That’s What I’m Here For, which was produced by Jay Reich, Jr. It was a much heavier, fiery album which featured a blistering version of Hey Joe. It was a showcase for Roy’s lightning fast blues licks, while the album featured moments of spontaneity and genus from one of the finest guitarists of the seventies. Proof of that was That’s What I’m Here For, which was a mixture of blues, blues rock and Southern Rock. Although it won favour with some critics, others thought it wasn’t an consistent album as Second Album. Granted there were moments of genius, but sometimes Roy failed to reach the same high standards he had set earlier in the album. As a result, That’s What I’m Here For didn’t replicate the success of Second Album. Despite that, Roy returned with his fourth album. During the first half of 1974, Roy had assembled what he regarded as his finest band. They would accompany him into the studio in the summer of 1974 to record In the Beginning. It was produced by Ed Freeman, and was released later in 1974. When In the Beginning was released, it critics discovered a much more consistent album. Roy’s playing was fluid and at the heart of everything that was good on In the Beginning. It was a much more laid back album which featured mostly R&B, including Fontella Bass’ Rescue Me, Al Green’s I’m A Ram, CC Rider and Mike Bloomfield’s You’re Killing My Love. There was even a cover of Joe Zawinul’s Country Preacher, on an album that featured the debut of vocalist Billy Sheffield. His addition was seen by some as an attempt by Polydor to shift units. Ironically, this backfired when the album wasn’t the success that Polydor had hoped. For Roy this was a huge disappointment. Roy owed Polydor just one more album, and looking for a way to discharge his contractual obligations, he decided to record a live album. It was decided to record two shows at New York’s Town Hall on the evening of November ’27th; 1974. The result was Live Stock, which was released by Polydor in 1975. It features seven songs, that prove the perfect showcase for the considerable talents of Roy Buchanan. He unleashes a virtuoso performance on what’s regarded as one of the best live albums by a guitarist. While it wasn’t the most successful album of Roy’s career, it was enough to convince a major label to sign him after his departure from Polydor. Next stop for Roy was Atlantic Records. He approached Ahmet Ertegun, who had witnessed Roy perform at the Carnegie Hall in 1972. Remembering that performance, and knowing what Roy Buchanan was capable of when he brought his A-Game, Ahmet Ertegun gave Roy a large advance and he signed on the dotted line. Not long after this, Roy began work on what was a very personal, autobiographical album, A Street Called Straight. It was Roy’s musings on his battle to stay sober and clean. The album was produced by and featured a cover of Jimi Hendrix’s If Six Was Nine, and Good God Have Mercy, which was penned by Billy Roberts who also wrote Hey Joe. There was also an instrumental My Friend, Jeff, which was a homage to Roy’s friend and fellow guitarist Jeff Beck. These tracks became part of Roy’s Atlantic Records’ debut A Street Called Straight. When A Street Called Straight was released later in 1975, the album wasn’t the success that the Roy and Atlantic Records had hoped. While it received praise and plaudits from some critics, others felt it was a slightly inconsistent album. There were moments of greatness, but a couple songs didn’t reach the same heights. However, Roy was heading in the right direction. For the followup to A Street Called Straight, Roy Buchanan was paired with twenty-six year old Stanley Clarke, the classically trained pioneer of fusion. He would produce what became Loading Zone. This seemed an unlikely partnership, given how different backgrounds the two musicians came from. However, just like Roy, Stanley Clarke was a talented musician, and the pair bonded over their mutual love of music. Despite his relative youth, Stanley Clarke was already an experienced and successful musician with a proven track record. That was apart from when it came to production. However, Stanley Clarke was also a talented songwriter would also play a small part in writing Loading Zone. When it came to writing Loading Zone, Stanley Clarke penned Heat Of The Battle. Meanwhile, Roy penned Hidden, Adventures Of Brer Rabbit and Tar Baby Ramon’s Blues and Done Your Daddy Dirty. Roy also wrote The Circle with Ron “Byrd” Foster and Scott Musmanno. The rest of the album consisted of cover versions, Booker T and The MGs’ Green Onions and Michael Narada Walden’s Judy and Your Love. These nine tracks were recorded at Clover Studios in New York and Electric Ladyland in Los Angeles, by Roy and the band. The recording sessions were quite different to previous Roy Buchanan albums, with different musicians were drafted in to play on different tracks. Producer Stanley Clarke played bass on three tracks and brought onboard several musicians he had worked before. This included guitarist Roy Gomez, drummer Michael Narada Walden and pianist Jam Hammer. They were augmented by various musicians, backing singers and vocalist Scott Musmanno who featured on The Circle. When it came to recording the cover of Booker T and The MGs’ Green Onions, two MGs made a guest appearance, Donald “Duck” Dunn and Steve Cropper, who also featured on The Circle, Ramon’s Blues and Done Your Daddy Dirty. They were part of what was a talent cast of musicians and vocalists, that played their part in the sound and success of Loading Zone. Once Loading Zone was completed, critics had their say on the album. It was released to critical acclaim in May 1977, and sold in excess of 500,000 copies. This was enough to for Roy’s second gold disc. No wonder, given the quality of music on Loading Zone. It finds Roy Buchanan and his talented band work their way through nine tracks. They’re the perfect showcase for Roy, who unleashes a blistering, fiery solo on The Heat Of The Battle, which has an unmatched intensity. Hidden is a much more underrated thoughtful track, which shows another side to Roy and his playing. So does The Circle, a mid-tempo soulful song with commercial pop rock sound. After this it’s all change. Adventures Of Brer Rabbit And Tar Baby feature Roy and Stanley Clarke enjoying a “pick-off,” with the guitar and bass intertwining to create a fusion of country blues and ragtime. Ramon’s Blues is a smouldering blues which features a guitar masterclass from Roy. He reaches new heights. Green Onions is then taken in a new direction, with Roy unleashing a scorching guitar solo that steals the show and transforms this classic. Although Judy is a ruminative track, Roy still enjoys the opportunity to showcase his virtuoso skills. Then on Done Your Daddy Dirty, Roy is encouraged by the band to kick loose as he unleashes blues rock solo. He’s got his mojo working. Your Love is a soul-baring, melodic and radio friendly ballad that closed Loading Zone, which was by far, Roy’s most successful album for Atlantic Records. They were delighted by their latest signing, who had already released two albums. Soon, two would be three when Roy began work on You’re Not Alone. This time, Stanley Clarke had been replaced as producer by Raymond Silva. Given the success of Loading Zone, Roy and Atlantic Records were keen to release a followup sooner, rather than later. So Roy got to work recording what would be the seventh album of his career. For You’re Not Alone Roy penned Supernova and cowrote Fly… Night Bird and 1841 Shuffle with Andy Newmark, Willie Weeks and Jean Roussel. They also wrote You’re Not Alone. Jean Roussel also penned the album opener, The Opening… Miles From Earth. The two other songs, were covers of Joe Walsh and Terry Trabandt’s Turn To Stone and Neil Young’s Down By The River. These songs would become You’re Not Alone. Recording took place at Atlantic Studios, in New York, with producer Raymond Silva. This time, Roy’s band featured a rhythm section of drummer Andy Newmark, bassist Willie Weeks and rhythm and acoustic guitarist Ray Gomez. They were joined by keyboardist Jean Roussel and Roy who played lead guitar on what was a very different album from Loading Zone. You’re Not Alone opened with The Opening… Miles From Earth, beautiful mini symphony which a showcase for keyboardist Jean Roussel. Joe Walsh’s Turn To Stone is reworked, with Roy’s searing guitar sitting atop an arrangement that veers between smooth to funky.Fly…Night Bird is an atmospheric and laid-back sounding track that’s reminiscent of Pink Floyd circa Dark Side Of The Moon. Roy’s guitar playing is understated, but effective on this mellow track. After this, Roy bowls a curveball. 1841 Shuffle starts off as showcase for Roy’s guitar, before he and his band launch into a jam. Still, though, Roy’s guitar plays a starring, despite being surrounded by a truly talented and versatile band. Neil Young’s Down By The River is reinvented, with Roy’s scorching guitar ushering in Gary St Clair’s worldweary lead vocal. Mostly, Roy and the band are staying true to the original, apart from when Roy unleashes another solo. In doing so, they breath new life into what’s a classic song. Supernova is the heaviest song on the album. Roy and band explode out of the traps, and power their way through fiery fluid slice of blues rock. You’re Not Alone is a ruminative ballad, where sci-fi synths accompany a reflective Roy during this eight minute innovative epic. It seems Roy’s kept one of the best until last. 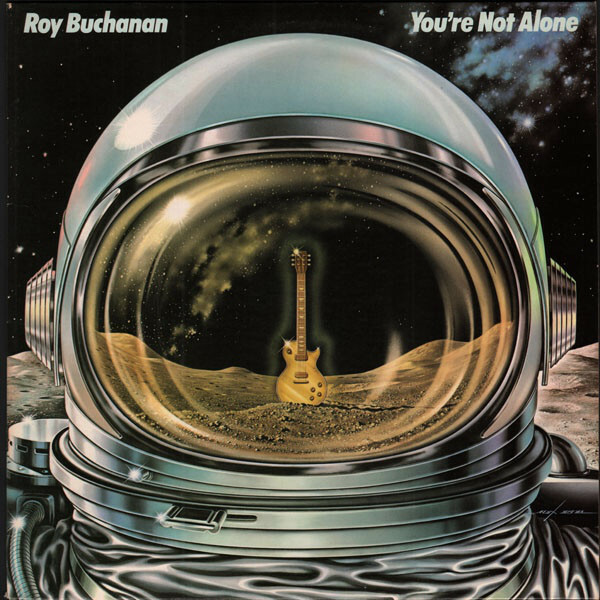 Critics on hearing You’re Not Alone, hailed it a much more ambitious, complex and sophisticated album from Roy Buchanan. However, it received the same critical acclaim as Loading Zone. Sadly, You’re Not Alone didn’t match the sales of Loading Zone. When the cover of Down By The River was released as a single, it failed to trouble the charts. For Roy Buchanan, You’re Not Alone was the one that got away. Since then, You’re Not Alone is an album that’s for too long, been overlooked by record buyers. That is a great shame, as it shows another side to Roy Buchanan. He’s a versatile musician, who seemed to enjoy being taken out of his comfort zone. Stanley Clarke certainly took Roy Buchanan out of his comfort zone on Loading Zone, which was one of the most successful albums of his career. Sadly, You’re Not Alone never sold in the same quantities, it too shows the different sides of Roy Buchanan. He’s best known as a blues rock guitarist, but since he released his debut was able to seamlessly switch between genres. 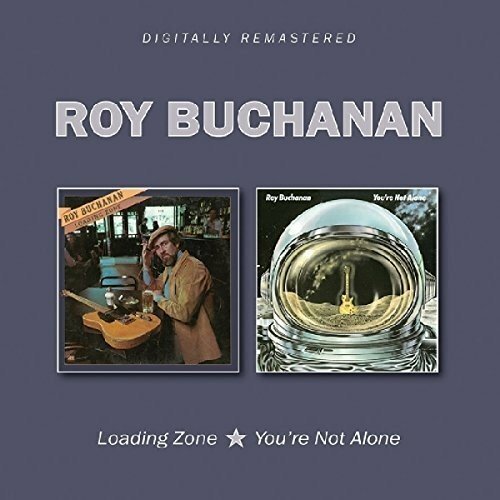 Roy Buchanan does that with aplomb on Loading Zone and You’re Not Alone which were recently remastered and reissued by BGO Records as a two CD set. Loading Zone and You’re Not Alone showcase the considerable skills and versatility of Roy Buchanan, who nowadays, is recognised as one of the greatest guitarists in the history of music. ← COME TO THE SUNSHINE: SOFT POP NUGGETS FROM THE WEA VAULTS.